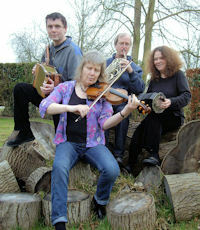 English Rebellion is a ceilidh band that specialises in public dances and folk festivals. They have been playing together since 2002. Solidly rooted in the English playing tradition, between them the band members have many years of playing in high-class ceilidh bands all over the country. The band has worked with some of Britain's top callers and can use their own high-quality amplification system when not provided by the venue.